Have you ever imagined what it'd be like if we could run iOS apps and games on our Android companions? We bet you have. Well, there are certain workaround techniques that allegedly allow you to do the unthinkable, but most of them require some kind of a virtual machine and the process is rather cumbersome. Project Cider might put an end to this, as it enables native execution of iOS apps on Android. Researchers from the Columbia University have created this “operating system compatibility architecture”, which does not use a virtual machine, but it still allows you to execute iOS apps on Android. In order to do its mojo, Cider makes use of a compile-time code adaptation method – it does not make any modifications to the source code of the iOS apps in question, it just adapts them to run on Google's platform. Along with it, some diplomatic functions let them connect to the host libraries of your Android device. Interestingly, the native Android libraries for 3D hardware acceleration are fully supported, as well. "Cider is the ﬁrst system that can run unmodiﬁed iOS apps on non-Apple devices." The developers behind Cider released a brief demonstration video, which shows us iOS and Android apps running side-by-side on a Nexus 7 tablet, which is running KitKat. At the moment, Cider does not support 2D hardware rendering, so the overall UI performance of most of the iOS apps is rather low. Despite this, we are treated to a 3D benchmark test, which shows us that “Cider's diplomats” are fully capable of making iOS apps use the GPU hardware of the tablet. The achieved 3D performance and frame rate are surprisingly adequate. Yelp, iTunes, iBooks, and Apple Stocks make a brief cameo in the Cider demonstration video, too – although choppy, all of them run on the Nexus 7. The developers claim that apart from apps, Cider also supports various iOS frameworks and services. However, we wouldn't expect project Cider to see the light of day at all, as it has a number of obvious legal and technical complications before itself. Nonetheless, it's a rather curious project, which once again reminds us about the flexibility and the multifunctionality of Android. Thanks for the tip, wilson! I think its cool. Just another cool thing that Android can add to its tool belt. It just keeps on making the best OS even better. Agree. It just proves how flexible Android OS can be. Anyone noticed first comments are usually short to ensure it will be posted first? Never saw a loooong first comment. #unsolicitedadvice Dont mind me, go on. Android - ADVANCED Operating System! Just get an iphone lol! Says the unfunny Fandroid kid. Why buy a tiny little toy, with a tiny little non HD display, no NFC, no multi-window, no real multitasking. When you can buy flagships like the Galaxy S5, HTC one, Xperia Z2, Note 3, and many more that are superior to any iPhone in terms of hardware and software specs. You can do much more on any Android then could ever dream with any iPhone. Never saw this coming. Guess this was unavoidable though unexpected it is possible. 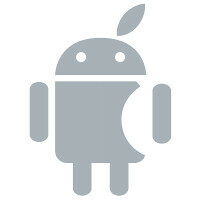 Now I am waiting Android apps on iOS. Don't get excited, this will never be released publicly. Apple's legal department is already drafting the cease and desist orders. Yea....this would never see the light of day. My first post was gonna say LAWSUIT!! Who would want buggy, force close apps on iOS? The real question is, why would we want buggy force closing apps from iOS? Stuff taken from a polished turd is still crap. As an example of what not to do maybe?